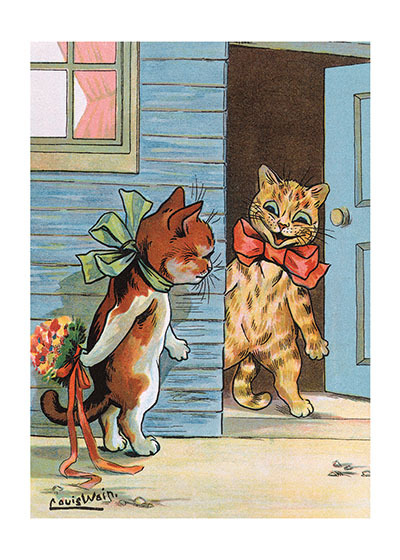 INSIDE GREETING: I love you once, I love you twice, I love you better, Than cats love mice. This coy cat is from the greatest of cat illustrators, Louis Wain (1860 - 1939) whose life was filled with tragedy and triumph. He discovered his propensity to illustrate cats when his wife was ill with cancer and their cat brought her comfort. 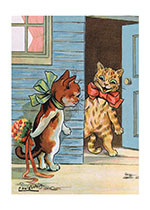 He struggled with mental illness his entire life, and despite his great success as an illustrator was at one point confined to a grim mental institution until H. G. Wells (and other luminaries) discovered his plight and he was moved to a pleasant hospital, where he lived out his days drawing cats.